Hello I purchased your ajax dropdown categories module and its fantastic. I need to know how to change the submit button label to something else instead of "ok" such as "submit" or "find". 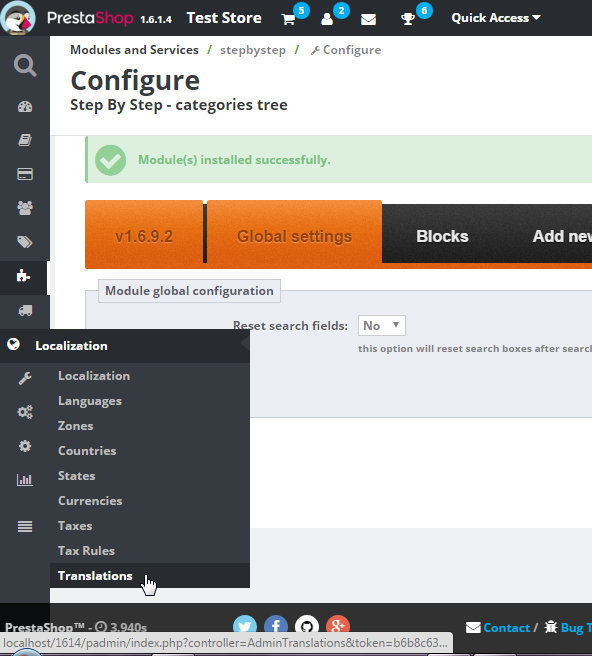 I use PrestaShop 1.6.1.4 and recently released version of the module. Can you please show me how i can achieve it? Thank you for choosing our ajax categories filter based on dropdown selection boxes. To change submit "ok" button other text you can use "translations" feature that is available in prestashop by default. Please follow steps below to achieve what you expect. that's all. After save your "OK" button will disappear and you will see button with text that you defined in translations tool.